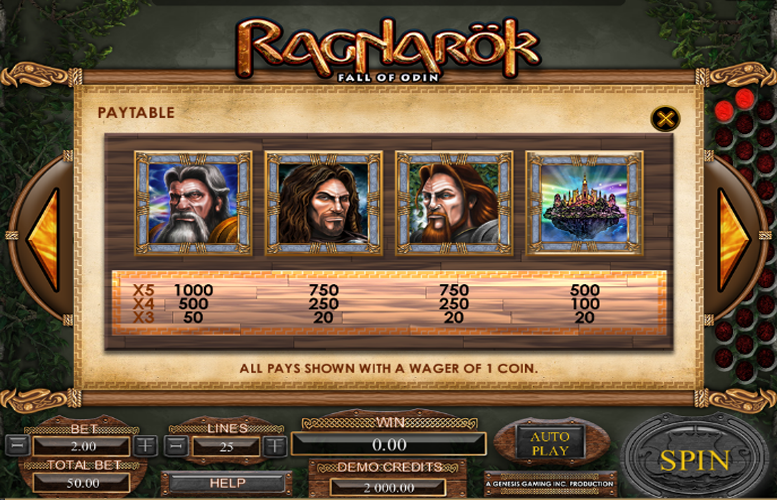 The Ragnarok slot machine is a great game that’s inspired by Norse mythology. The title has loads of special features and the artwork is tastefully delivered. Players will likely find themselves returning often to the game because it’s very difficult to see all that it has to offer on a single visit. This one is ideal for fans of legendary tales and innovative slot machines alike. Great artwork. The slot’s mythical theme is complemented well by the classically-inspired illustrations. Loads of variety in bonus features. With three different levels of bonus features to unlock, it’s unlikely that players will get bored quickly of the Ragnarok slot machine. Rather low betting limits. 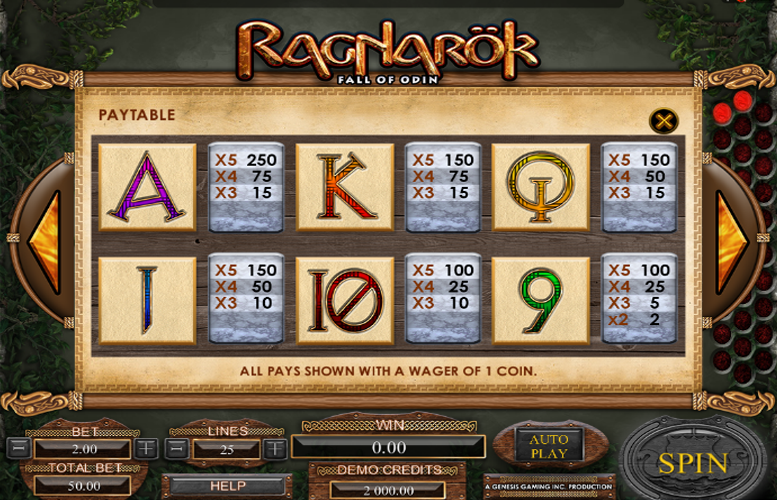 At just £50 per spin, some of the highest rollers will find Ragnarok’s maximum bet a little on the stingy side. Grey Bearded God = 1,000x the coin value. Dark Brown Haired or Light Brown Haired God = 750x the line bet. Sky Kingdom = 500x the line bet. Players will collect Runes to unlock different feature levels. Runes are awarded randomly after any bought spin and after any feature trigger. Landing three or more “scatter” symbols will trigger the Thor Free Spin feature. The Player will be awarded 10 free spins with all wins subject to a 2x multiplier. Landing three or more “scatters” will trigger an additional 10 free spins. If the player collects 15 Runes, they will unlock Ragnarok Level Two. Here, landing three or more “scatters” will trigger the Thor or Freyr bonus feature. The player will be taken to a second screen where they must choose either game mode. The Player will be awarded 15 free spins with all wins subject to a 3x multiplier. Landing three or more “scatters” will trigger an additional 15 free spins. The player will be awarded with three attacks on five targets on a Fire Giant monster. Each of these attacks will reveal either credits or a multiplier. If the player picks a credit value, the credits are added to the current feature total. If the multiplier is selected, the current feature win is multiplied by 5. If the player collects more than 30 Runes, they will unlock the final level. 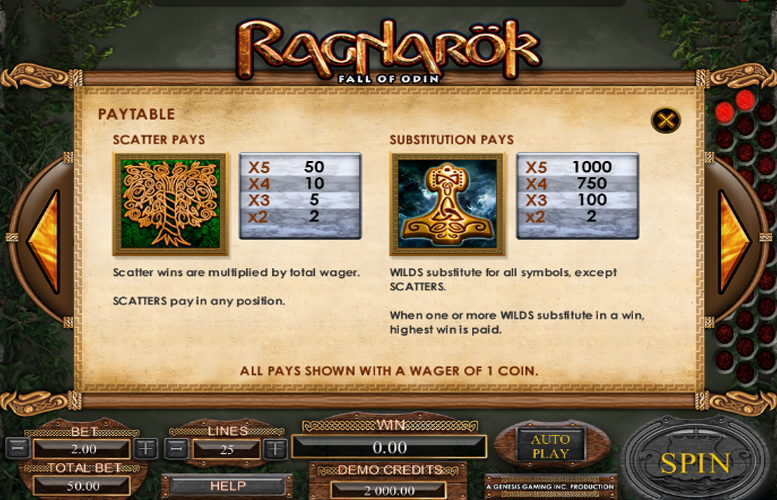 Here, landing three or more “scatters” will trigger the Thor, Freyr, or Odin bonus feature. The player will be taken to a second screen where they will choose between the special game modes. The player will be awarded eight free spins with all wins multiplied by three. Every spin will have extra “wilds” added to the reel windows randomly. Between one and 15 “wilds” can be added for every spin. The Player will be awarded three attacks on five targets against the Fire Giant. Each attack will reveal either credits or a multiplier. If the player picks a credit value, the credits are added to the current feature total. If the multiplier is selected, the current feature win is multiplied by the multiplier. The possible multipliers are 5, 6, 7, 9, or 10x. The player is awarded eight free spins. These will have special “Rune” symbols added to the reels. Any “rune” symbols appearing on the reel window prompts the player to pick one of three runes. The selected rune will reveal either a credit award or a game symbol. Each rune on the reel window is replaced with the revealed rune. Landing three or more “scatters” will trigger an additional eight free spins. Ace = 250x the coin value. King, Queen, or Jack = 150x the line bet. Players can adjust both the size of the bet placed per win line and the number of win lines played per spin. The highest and lowest win line values are 25 and one respectively. Meanwhile, it’s possible to bet between 1p and £2 on each. This makes the lowest bet per spin available just 1p and the highest a rather uninspiring £50. Most recreational players will find this more than sufficient. However, some higher rollers might find it limiting. 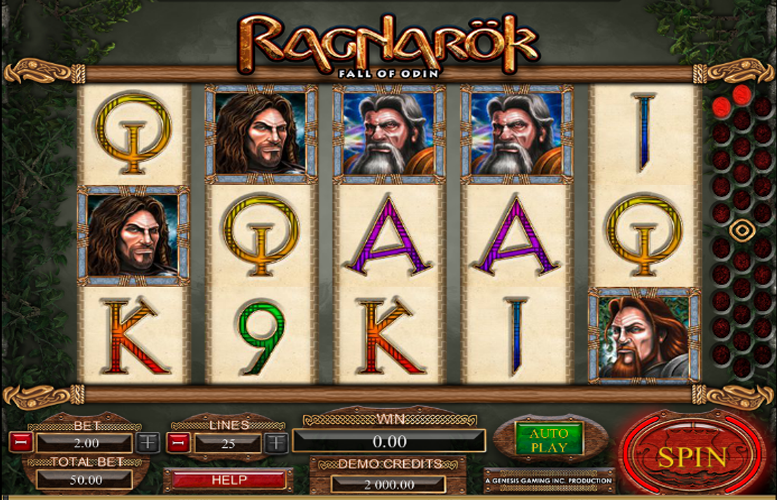 All told, we’re impressed with Ragnarok from Microgaming. It has a fantastic look and feel to the game and a whole host of diverse special feature. By splitting these into different levels, the designers have managed to keep the action varied and ever-changing. We think players who enjoy a slot machine that keeps offering new content will appreciate this one a lot. This game has a rating of 4 / 5 with 533 total reviews by the users.